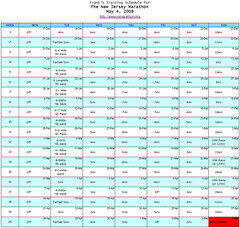 In addition to doing the New York Marathon in November of 2008, I’m preparing to run the 2008 New Jersey Marathon. I just finished preparing my 20 week training schedule. I employed the use of a spreadsheet to make the date calculation easier. You can see the spreadsheet here: http://spreadsheets.google.com/pub?key=pJjURRqYxprqK-lVXVPAgVQ. Following a marathon training schedule is always a challenge when coupled with my heavy commitment to karate training, weight training, and boxing at Gold’s Gym. The first week of the training program begins December 17, so I have just about one month to set my base mileage of 20 miles per week. As part of the training, I’ll run the Hamilton Hangover 5mile Race on January 1st and the E. Murray Todd Half Marathon on March 2nd. January and February will bring two weeks of special winter karate training, as well as a polar bear plunge. April is sure to bring a karate tournament. Robert Thompson to be Publisher of The Wall Street Journal? Will Robert Thompson, editor of the Financial Times, be installed as publisher of The Wall Street Journal by Rupert Murdoch? This remains to be seen after News Corporation passes the remaining regulatory hurdles it faces in acquiring Dow Jones. Sources cited by Guardian Unlimited say News Corporation has no official comment. You are currently browsing the Sconzo.com weblog archives for November, 2007.